Gives you the flexibility to take pictures in the most popular focal lengths, all with one lens. Ideal for portraits or travel photography. Autofocus for ease-of-use. Focus down to 10 inches for dramatic close-ups. Sharpness falls away from about 75mm. Used this lens on an old F90x back in the film days. Revived it for a D600 after noting some excellent reviews. It has limitations, such as its sharpness falling away at around 75mm. However, it is excellent up to 75mm, being very sharp, capable of considerable enlargement, and produces excellent color rendition. 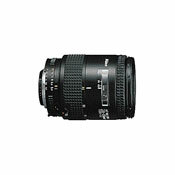 Its a great general purpose lens and can be obtained quite cheaply at between US$100-$150. Fast, accurate focus on my D70 or F801S, sharp, great color fidelity and drop dead gorgeous bokeh. What more could I want? Oh, it's also very tough and durable. Mine has been knocked about but good and had taken many a tumble onto the floor of the car without a problem and I bought this used. So they are tough. This is my favorite Nikkor lens and I have plenty. It competently does everything it was designed to do. If I must state a weakness it would be that it is only capable of f3.5 and I'd like it to be f1.4! Of course, I'm dreaming. This is an AF lens I bought used from KEH for around $80 and didn't really know what to expect. I wanted to use it as an all-around lens for my street photography on either my F801S film camera or my D70 digital. I've used it plenty on both cameras, though of course it delivers a higher range of focal distances on my digital than on the film. Lately, I've been using it a lot on my D70 with wonderful results on the street. Even though it's only f3.5, night shooting is fine at ISO 800 because, with the digital, you can hand-hold down to 1/15 even at the max zoom of 85mm (127mm FX sensor) if you have a steady hand. I really love this lens and, as stated above, it's the best all-around lens I've ever had. It's done great portraits, beautiful landscapes, macros, and is a dynamite street shooter because, on the D70, it focuses lightning fast. I have used this lens for a number of years so I'm not writing this based on a week of use. This lens has proven itself thoroughly. If it broke or I lost it, I wouldn't settle for anything other than another one just like it. Rockwell gave this lens a marvelous review but stated that his developed a sticky auto focus. I think it must have just been just his lens. Mine has seen a heck of a lot of use with no problems. I rate this a solid 5 with no hesitation. Fair sharpness at center at 28mm and good overall sharpness at 85mm. Lateral chromatic aberration kept low. Awful ghosting, coma at wide setting. Barrel distortion at 28, pincushion at 85. Nicely built, heavy, lots of metal, unlike any of the modern consumer zooms. If you know how to use it it can give good results. Stop down to f/8 and quality images can be taken..
For a 20 years old lens? cheap Good sharp and BEST BUY-made in japan. Good colour and contrast. Sharp in centre of frame at all apertures. Good solid build quality. Looks and feels like a 'quality lens'. Very cheap secondhand, probably because wider range zooms are more fashionable now. Autofocus accurate at all zoom settings even in the lowest of light. Probably better that a similar spec third party optic. Softness at edges has a very slight 'zoom blur' effect. Variable aperture depending on zoom setting could make the lens difficult to use with studio flash or if shooting tranparency and using a seperate light meter. This is a feature of almost consumer zooms alas! Results from using on a digital SLR: Excellent balanced saturation and contrast. Centre, nice and crisp at all apertures. Edges, softer if wider than f11 (will never quite match centre at any aperture). Softness of edges can have a very slight directional effect radiating from centre (like 'zoom blur' in Photoshop). No light fall-off (helped by the fact that a DSLR uses only 2/3rds of the 35mm area). Notieable but not offensive chromatic aberration at edges if high contrast (ie. blue fringing around fine detail against a bright sky like tree branches)irrespective of focal length. Probably a typical consumer zoom, fine for use if you are out for the day and don't want to carry other lenses around. Certainly not a replacement for prime lenses if you need to resolve fine detail across the whole frame. At the price chuck it and buy another! Poor build quality. Soft focus. Unclear rear element. I bought this 28-85 lens to put on my D100 and was getting very dark results even when compensating plus 0.7. I have since found out that it was the CPU giving false apperture readings. I think this is very poor qualitly control from Nikon.I have since returned this lens. Now for a rethink. Excellent lens.28-85 covers most situations and flash coverage.Great macro is icing on the cake.Takes 62mm filters.Too bad it's not internal focusing,but it's a sharp zoom with little distortion. No IF. Zoom ring is okay but not ultra smooth. Macro. For the price that you can get this older AF Nikkor Zoom, the lens is a terrific performer. I have the upgraded "n" version. Like any zoom, if you use it at its extremes (i.e. 3.5 @ 28mm) you will notice a bit of light falloff and slight loss of sharpness at the edges. But, otherwise, this is a very sharp lens! I bought it for just that and I haven't been disappointed. It's fairly compact and lightweight, but feel substantial enough. Anyone who thinks it's heavy is younger and has only used plastic equipment. I use it on my N90s and N8008s and it balances quite nicely. If you want a normal zoom for everyday shooting and don't have a big budget, I recommend this if you can find one in excellent to mint condition. BTW, you can tell the "n" version buy its rubber focus ring. The older version had a thin, hard plastic ring. Also, working distance with macro feature at 28mm is not practical. sharper than most zooms. Good wide open. LOW distortion. Top notch image quality. Low distortion than most zooms. Negligibe light faloff. Good wide open. Sharp at 28-85mm wide open and best at f8. Can't beat the price and it's better than the new crap. Really does work great with matrix metering. Can use it like a point and shoot in crowds, with good results. vari-focal, not recommended to use manual focus, you'd just be too busy. Bought the N version of this lens about 10 years ago. It's sharp stopped down a stop at all lenths. It's been used as a travel lens and in such places as Disneyland, its irreplaceable. I shoot mostly prints, and pictures with Disney characters and scenery are crisp and snappy. The lens has a B&W sky filter that warms up skin tones ever so slightly. I have nothing but good things to say about this lens. It's not prime, but it is sharp. At 28mm-35mm it's good from center to corner with little distortion. At 85mm my sample is sharp, but not as sharp as my constant F4 70-210 nikkor at the same 85-105mm range, but it makes nice portraits that I've enlarged to 8x10's that look great. I understand the N version to be an improvement over the original AF version. Used w/N80 and 8008s.